MANILA, Philippines, November 14, 2013 (ENS) – Amidst the deaths and devastation wrought by Super Typhoon Yolanda/Haiyan that lashed the Philippines last weekend, the island nation has caught a much-needed break. The rice crop was spared because the storm struck in between planting seasons, say officials with the International Rice Research Institute. Leyte, the province that endured the worst of the typhoon, is a rice–producing province, with more than 100,000 hectares of rice land. Between 2000 and 2009, Leyte posted the third biggest increase in rice production among all provinces, and has the highest average annual growth rate in terms of yield per hectare. Coming from an assessment meeting with the Philippine Department of Agriculture today, V. Bruce J. Tolentino, IRRI deputy director general for communication and partnership, said that the typhoon struck Leyte after most farms had already completed their wet season harvest and were just starting to prepare for the dry season crop. “The most serious issues will arise from extensive losses resulting from the storm surge – in farm machinery, storage, housing, and damage to roads and irrigation. These will need replacement and rehabilitation,” said Dr. Tolentino. As of tonight, the Philippines National Disaster Risk Reduction and Management Center confirmed that the typhoon has claimed 2,357 lives. The number of confirmed deaths is much lower than the 10,000 estimated by local Leyte officials immediately after the storm. In addition 3,853 people are reported injured and 77 are still missing, nearly a week after the storm left the islands heading westward across the South China Sea. A total of 8.67 million Filipinos were affected in some way by the typhoon. IRRI Director General Robert Zeigler expressed his condolences to those affected and linked the severity of the storm to climate change. IRRI staff and friends are collecting donations of money and supplies for people affected by the typhoon. As climate change continues to add to challenges for rice production, Filipino farmers respond by planting climate change-ready rice varieties developed by IRRI and released by the Philippine government. About five million farmers across Asia are now using “scuba” or flood-tolerant rice, which can withstand submergence for up to two weeks. As part of its response to help people affected by the typhoon, the International Rice Research Institute, with the Department of Agriculture, will provide seeds of flood-tolerant rice to farmers. “The current rice crop in the affected regions accounts for less than 10 percent of the Philippines’ annual national rice production, and most of the rice crop in these regions had already been harvested before the typhoon came,” said Samarendu Mohanty, IRRI economist and head of the institute’s social science and policy arm. Still, Dr. Mohanty said that it will take more time to determine the full extent of the damage to the country’s rice crop. The extent of flood damage to rice that was stored on farms and in public and private warehouses remains to be seen. 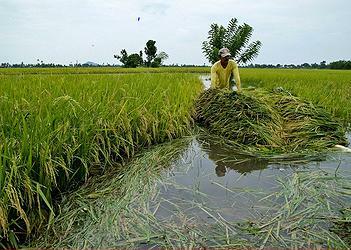 Philippine rice farmers have to cope with more than 20 typhoons each year. Super Typhoon Yolanda/Hiayan was the 25th typhoon to hit the islands this year. 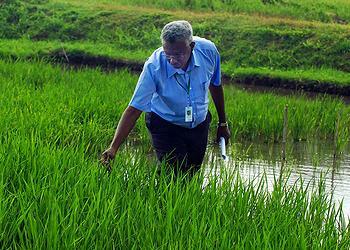 IRRI continues to work on making rice more resistant to extreme weather conditions. This includes studying how rice can thrive despite salty soil, hot or cold weather, submergence and drought.